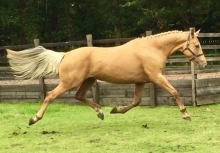 Exceptionally talented 6yr old 16.1hh chestnut mare with extremely eye catching blonde mane and tail. Beautiful old fashioned Irish bloodlines which include King of Diamonds/Puissance/Cloverhill. Very competitive at 1.10m level and multiple wins/top 6 placing. Recently moved up to 1.20m. Plenty of scope, brave and forward xc and straight and correct on the flat. Has also been placed in working hunter classes. Over 50 SJI points accumulated in one season. No blemishes or vices and is easy to box, shoe, clip and hack. Snaffle mouth and ridden by males and females. Not at all mareish. 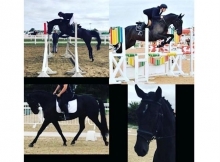 This young lady is a fabulous model of an Irish horse and will excel in any sphere as a potential junior event horse, competitive amateur showjumper or a top class working hunter. Excellent trial facilities and close to main airports. Serious enquiries only. Only for sale due to house move.